We all know that many things change as we age. I just never figured my hearing would go so soon. There is a “mosquito ringtone” that teens are using on their cell phones because the teachers can’t hear it. Apparently, the ear changes at about eighteen. So, high schoolers can text message each other during class and the powers that be are none the wiser. It seems impossible, but the New York Times (free reg req) had a piece on it, and CBS News has a good overview, as well as a link to the sound. If I get really close to the speakers of my laptop, I can barely hear something. The high-pitch sound is almost drowned by the sound of the computer itself. 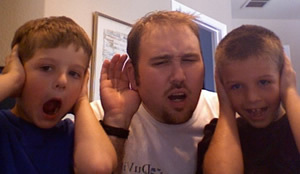 Since I’m watching my nephews (ages six and eight) this week, I thought I’d see how well they can hear it. They have no trouble, many feet away from the computer, even. Sadly, the original recording of my nephews is lost along with all my other Odeo recordings. But, 12 years later, I now have kids of my own. My daughter (nearly six) came into the office recently and we did our own hearing test. This one ramps up from sounds almost anyone should be able to hear to that special frequency that is just for kids. Unlike when I was in my 20s, I can’t hear it no matter how close I get to my computer. Another generation of youth ruined for their parents by reckless uncles. Adults may stink, Adam, but you rock. Now, all you need to do is install that ringtone on your nephew’s cell phones. Yeesh, that’s an obnoxious sound. I have no problem hearing that from anywhere in my house. How addicted to cell phones does a teen have to be to be willing to endure that as a ringtone? That reminds me of when i was a house painter for a summer. One old lady had a device that let off a sound like that to scare off racoons from her fish pond. I had to ask her to turn it off whenever i was there as it was quite painful. Wow – whoever thought of that is genius. I think I missed out in high school now. This is so funny. I just loved their little voices. Did you actually play the sound that they could hear? All I hear was them. What a good Uncle Moo you are.